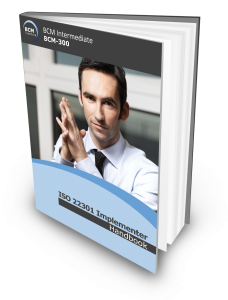 This is a 2-day intermediate business continuity management (BCM) course that incorporates the BCM-200 ISO 22301 BCMS Planner course on its 1st day. Participants will follow be given the opportunity to practice the fundamental concepts of risk analysis and review (RAR), business impact analysis (BIA), business continuity strategy (BCS), Plan development (BC Plan), testing and exercising via hands-on and interactive sessions with fellow participants from various industries on the 2nd day of the course. Participants are expected to complete an actual RAR, BIA, BCS and BC Plan templates using your organisation examples. This hands-on practice would be facilitated by industry practitioners that include current BCM managers, consultants and vice presidents from renowned banks and higher institutions. At the end of the course, participants will have to attempt the 2 1/2 hour Qualifying Business Continuity Certified Specialist exam. The exam is a 100-Multiple Choice Question (MCQ). BC Certified Specialist (BCCS) Certification is awarded to participants who successfully completed and passed the Qualifying BCCS examination attached to the course, sends in an application detailing at least 1 year of BC experience , make the application processing fee payment of SGD75 and satisfies and meets the experience requirements of the independent certification body. Assist the business head in determining and implementing the BC project and plan. Identify possible threats that may disrupt critical business functions in the business units and organization. Identify and analyze business requirements to recover the business unit’s critical function. Develop effective functional response and recovery plans. Conduct tests and exercises as part of the organizational requirement. Strengthen organisational resiliency to counter major incidents and disasters. This course is designed for Middle Management, Department Representatives, Business Unit BCM Coordinators; BC/DR Managers. This course incorporates a 100-Multiple Choice Question electronic exam the next day. The duration of the examination is 2 and 1/2 hour. Candidates who achieve with a passing score of 75% or higher are eligible to apply for the BCM Institute’s Business Continuity Certified Specialist (BCCS) accreditation. The examination fee is included as part of the course fee. SGD75 (Certification Fees are to be paid during application after participants have passed their Qualifying BCCS exam). The course fee includes the BCCS examination fee.